be considered in the plans of the enemy. Distillation equipment cannot produce water quickly enough to be used for fire protection. Do not permit your treated water to be used for this purpose except in extreme emergencies. Raw water should be used whenever possible. The use of reverse osmosis water purification equipment by the military has produced potable water from the sources available in a combat field environment. The reverse osmosis water purification unit (ROWPU) is capable of treating freshwater, brackish water, and seawater. Additionally, the unit is capable of treating water contaminated with chemical, biological, and radiological warfare agents. When using the unit to treat water contaminated by CBR agents, you must use the equipment in conjunction with auxiliary ion exchange and carbon adsorption units. The ROWPU used by the NCF is capable of producing 600 gph of product water from freshwater sources and 400 gph of product water from seawater at 70F. The rate of water production in the ROWPU depends upon the operating pressure, normally 350 to 550 psig for freshwater and 750 to 950 psig for seawater. Temperature affects the rate of flow. Cold water decreases the flow, while warm water increases the flow. NOTE: Maximum operating water temperature of the ROWPU feedwater is 120F. Water temperatures above this figure may damage the membranes within the reverse osmosis modules. Reverse osmosis (RO) is a purification process in which filtered water is pumped against a semipermeable membrane under great pressure. The membrane allows product water to pass through while rejecting impurities, both dissolved and suspended. You must use an extremely high pressure for a usefull volume of water to pass through a unit membrane. The reverse osmosis process is shown in figure 9-13(A). Reverse osmosis may appear to be nothing more than a filtering process, but there are distinct differences. In filtration, the entire liquid stream flows through the porous filter medium and no chemical changes take place between the feed and the filtrate. 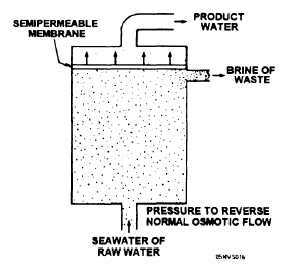 In RO, the feed flows parallel to the semipermeable membrane with a fraction of it passing through a given membrane area; dissolved ionic and organic substances are rejected by the membrane and, in this case, drained off as a brine. Figure 9-13(A). - Reverse osmosis process.